stitcher to embroider tiny little transformers or millenium falcons. designs, the one that looks the most like your wisher with what he/she is wishing for, whatever will work best for your project. Don’t you know you’re going to sew the Monkey. wow! it’s perfect! I am in awe. And now I am going to browse the patterns in your shop. That’s just gorgeous! Traditional and modern att the same time and a clever way to use a series of embroideries! Oooh what a great layout for those embroideries. And your boy is obsessed with the same things my boy is. ‘are you going to buy me a lightsaver’ for christmas? the daily question. Would make cute T-shirts for Christmas night PJ’s. i just need some guts to put my stitching together. i dont know what i am doing and i am too scared to let go and make the damn thing! you inspire me. This came out great, I love them all together. Got my package today, thanks! The quilt is beautiful and I am sure he will be quite snuggly warm too. 5. You can never run out! you are such a phenomenal embroiderer! I aspire to be better at it some day! 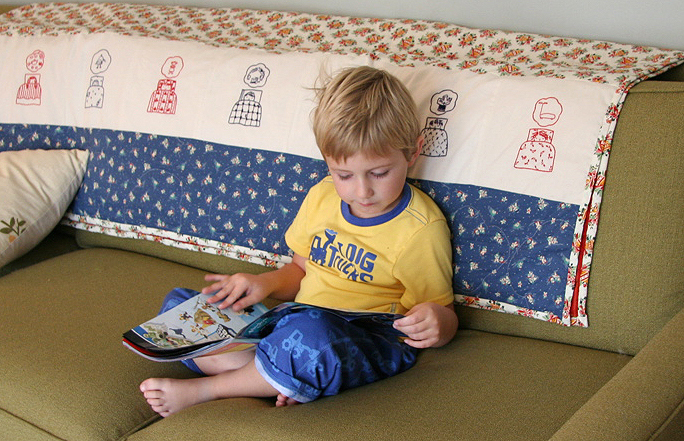 These designs are so charming, and your quilt is beautiful. You astound me with all that you manage to do. Fleecy monkey is adorable too! Hi Hillary, I love the embroideries, the quilt, the monkey, and all your other stuff! I was wondering — have you thought of making your banner into an embroidery pattern? It’s so cute! What a lovely quilt! I don’t know where you find the time! Also, how do you keep your couch so clean? You are a better woman than I.
i LOVE the design of the long bands and them all sleeping next to each other. that is PERFECTO! and how precious…sitting there looking at those toy catalogs. i think i have just as much fun looking at those catalogs as the kids do! How sweet; love your stitches and how you incorporated them into your quilt. Can’t wait to see the whole quilt. A sock monkey?! I was trying to resist until that detail appeared. 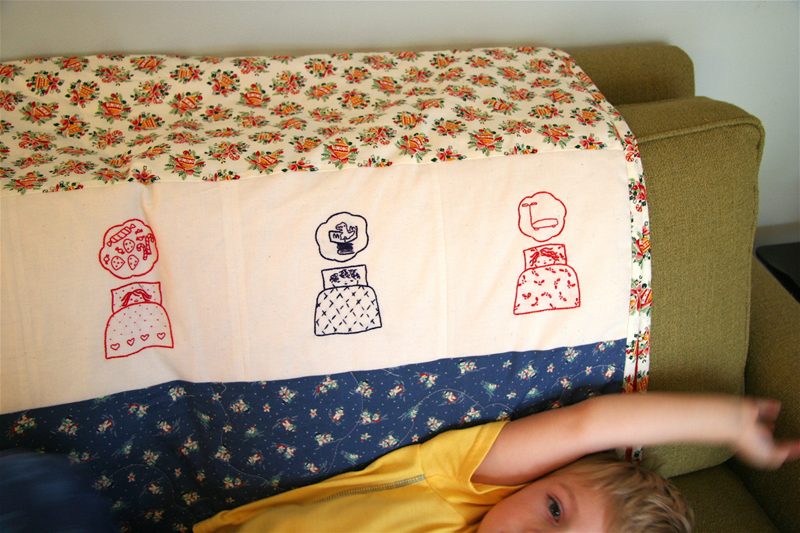 The quilt is darling. I love something that’ll go together quickly. I just bought your Christmas dreams and the candy cane fairy collection–I believe my second quilt is in order. I’ve been lurking for so long. Now that the baby is walking, I have my hands free sometimes. Thank you for sharing all your lovelies. Oh–may I share your photos and link on my blog–I’d love for my sewcraftblog group to see the next project. you’ve got two beautiful children and I can tell that they’re being brought up in a place full of love. They’re so lucky to have a mum like you. A mum with good taste I might add! Love your blog! Love the designs and the way you put the quilt together. How did you do the bubble quilting? Free motion or just careful straight stitching?? I like your quilt idea. Are there any sugar plums dancing in their heads? Brilliant Hillary! I love the line up of Christmas dreamers!